Example of a European profile cylinder seen from the outside. Even before analysing the technical features, in order to recognise a good quality cylinder one should not forget that the first thing to keep in mind in order to choose the suitable product is to ask yourself what needs must be satisfied. For example, the choice of the cylinder for the main entrance door often falls on a model which is as resistant as possible to any kind of attack, whilst for interior doors or gates the adopted solutions are generally simpler and less expensive. But beware; whilst the interior doors of a room, except in special cases, are normally only for service purposes and are not security doors (on which, therefore, it makes little sense to install a “super cylinder”), secondary accesses, such as condominium gates/doors, French windows to gardens and balconies, dormer windows on the roof etc. are all passages potentially subject to attacks from the outside and so it is not very wise to leave them unprotected, compared with the front door. The most commonly used material for the construction of the bodies and the plugs in the European profile cylinders is almost always brass, which guarantees duration over time, often with nickel-plated external finishing; whilst the composition of the pins and the counterpins, and more generally the internal components, can vary. The inside of a good quality cylinder, which is effective against possible break-in attempts by burglars, consists of more resistant materials, such as stainless and/or hardened steels. 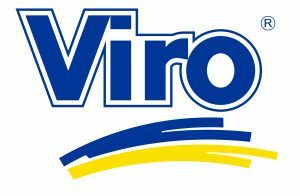 Specifically, the Viro Palladium cylinders possess anti-drill plugs made of hardened steel, a stainless steel pull-resistant reinforcement bar and pins made of hardened stainless steel. Brute force attacks are among the most common, because they only need tools such as: drill, pliers, hammer and chisel to act on the body and the cylinder plug, trying to break it, pull it out or knock it inside and then trip the lock. In order to defend against this type of break-in attempt, it is worth fitting the cylinder with anti-drilling reinforcements, but above all with anti-pull reinforcements. 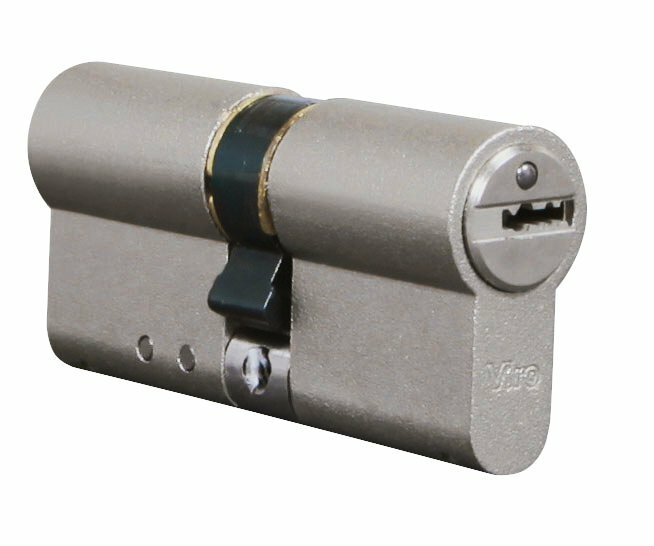 The high security Viro Palladium cylinder. 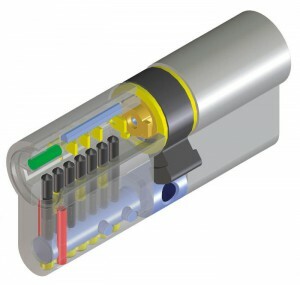 The anti-drill pins in the body are highlighted in red and the anti-drill pin in the plug is highlighted in green. In this case, the pins and the counterpins (highlighted in black) also have an anti-drill function. Also, to prevent the cylinder from being forcibly knocked inside, it is worthwhile providing anti-withdrawal cam. In the Viro Palladium high security cylinder, the cam (indicated by the arrow) is of the DIN anti-withdrawal type and the pull-resistant reinforcement consists of a sturdy AISI 304 stainless steel bar (highlighted in blue in the lower part of the photo) with a diameter of 6 mm, which passes through most of the cylinder body. 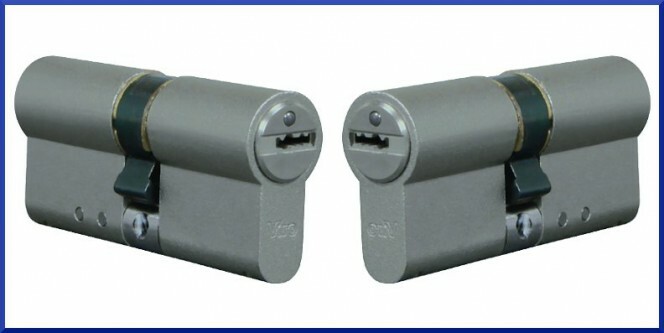 The quality of a cylinder can also be recognised by the resistance to the most insidious forms of attack, using lock-picking and key-bumping –techniques which will look at in more detail in future blogs. However, even the most resistant cylinders will not prove worthwhile if it easy to obtain an illegal copy of the keys. 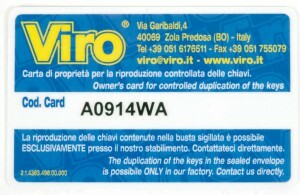 For this reason, the keys of the Viro Palladium .PV and .PB series fall into the category of those with controlled duplication; in fact, in order to obtain a copy, it is necessary to got to an authorised centre, with an original key and the coded ownership card, provided in a sealed envelope inside the cylinder package. 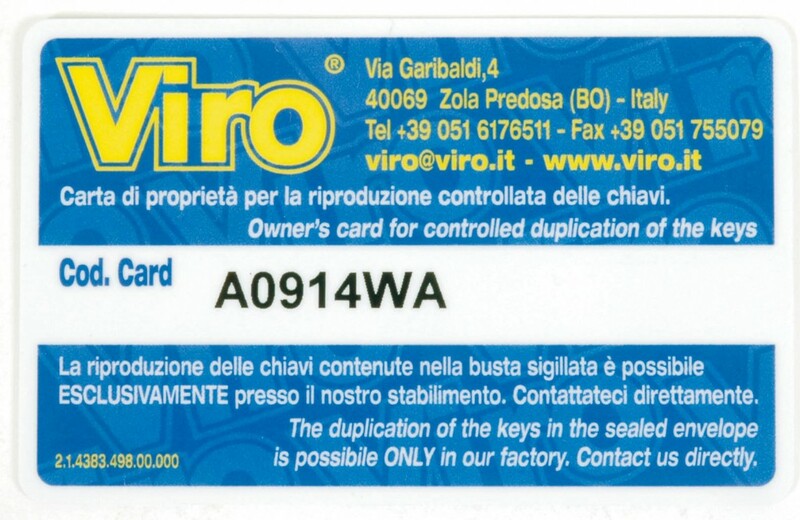 A Viro coded ownership card, which only allows the keys to be copied by the rightful owner.